Chef Ciel and her friends go to karaoke after the New Year's party. In karaoke, they sing songs, and moreover, recent karaoke machines can score their performance. To get a high score, one of the most important things is to sing with correct pitches. f(t) = BN−1, for AN−1 ≤ t < +∞. On the other hand, Ciel cannot change her pitch instantly. So Ciel's pitch g(t) must satisfy the condition |g(x) − g(y)| ≤ K |x − y| for all real x and y. In particular g(t) is a continuous function and |g'(t)| ≤ K for all t where g'(t) exists (g'(t) denotes the derivative of g(t)). The score assigned to Ciel by the karaoke machine is the value of the integral of |f(t) − g(t)| over the interval (−∞, +∞). Your task is to calculate the minimum value of this integral over all possible functions g(t) that satisfy the above condition. Each test case consists of exactly 3 lines. The first line of each test case contains two space separated integers N and K. The second line contains N−1 space separated integers A1, A2, ..., AN−1. Finally, the third line contains N space separated integers B0, B1, ..., BN−1. For each test case, output a single line containing the minimum value of the integral mentioned in the problem statement. 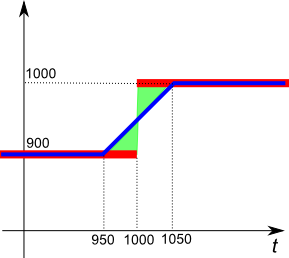 The output must have an absolute or relative error at most 0.000001 (10−6). Please, note that your output should not have more than 1000 digits after the decimal point, otherwise you may (or may not) get wrong answer or runtime error (SIGXFSZ). The following figure corresponds to the example case 1. Here the bold red line denotes the correct pitch f(t) and the blue line denotes the optimal Ciel's pitch g(t). The answer is the area of the green region.